1 Two SRS (Supplemental Restraint System) front airbags. The driver’s airbag is stored in the center of the steering wheel; the front passenger’s airbag is stored in the dashboard. Both are marked SRS AIRBAG. 2 Two side airbags, one for the driver and one for a front passenger. 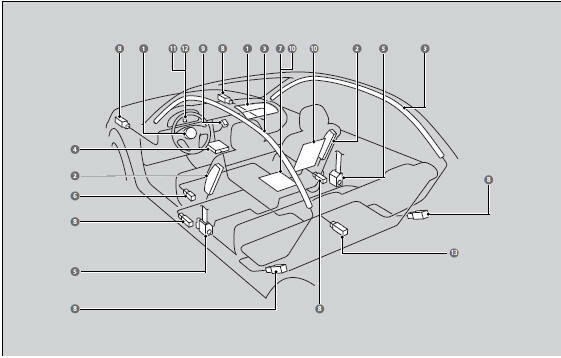 The airbags are stored in the outer edges of the seatbacks. Both are marked SIDE AIRBAG. 3 Two side curtain airbags, one for each side of the vehicle. The airbags are stored in the ceiling, above the side windows. The front and rear pillars are marked SIDE CURTAIN AIRBAG. 4 An electronic control unit that continually monitors and records information about the sensors, the airbag activators, the seat belt tensioners, and driver and front passenger seat belt use when the ignition switch is in ON . 5 Automatic front seat belt tensioners. The driver’s and front passenger’s seat belts incorporate sensors that detect whether or not they are fastened. 6 A driver’s seat position sensor. If the seat is too far forward, the airbag will inflate with less force. 7 Weight sensors in the front passenger’s seat. The front passenger’s airbag will be turned off if the weight on the seat is 65 lbs (29 kg) or less (the weight of an infant or small child). 8 Impact sensors that can detect a moderate-to-severe front or side collision. 9 An indicator on the dashboard that alerts you that the front passenger’s front airbag has been turned off. 10 Sensors that can detect if a child or small statured adult is in the deployment path of the front passenger’s side airbag. 11 An indicator on the instrument panel that alerts you to a possible problem with your airbag system or seat belt tensioners. l2 An indicator on the instrument panel that alerts you that the front passenger’s side airbag has been turned off. Airbags can pose serious hazards. To do their job, airbags must inflate with tremendous force. So, while airbags help save lives, they can cause burns, bruises, and other minor injuries, and sometimes even fatal ones if occupants are not wearing their seat belts properly and sitting correctly. What you should do: Always wear your seat belt properly, and sit upright and as far back from the steering wheel as possible while allowing full control of the vehicle. A front passenger should move their seat as far back from the dashboard as possible. Remember, however, that no safety system can prevent all injuries or deaths that can occur in a severe crash, even when seat belts are properly worn and the airbags deploy. Do not place hard or sharp objects between yourself and a front airbag. Carrying hard or sharp objects on your lap, or driving with a pipe or other sharp object in your mouth, can result in injuries if your front airbag inflates. Do not attach or place objects on the front airbag covers. Objects on the covers marked SRS AIRBAG could interfere with the proper operation of the airbags or be propelled inside the vehicle and hurt someone if the airbags inflate. Do not attempt to deactivate your airbags. Together, airbags and seat belts provide the best protection. When driving, keep hands and arms out of the deployment path of the front airbag by holding each side of the steering wheel. Do not cross an arm over the airbag cover.